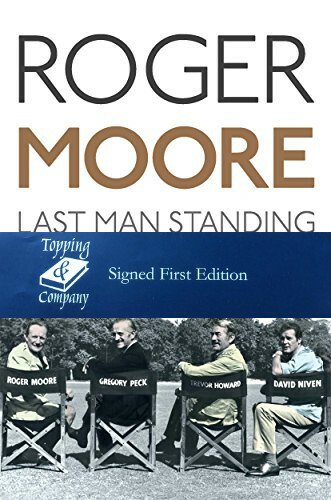 In a movie career that spanned over seven decades, Sir Roger Moore established himself as arguably the most debonair of the 007s. Famed all over the world as the quintessential Englishman, he was also a tremendous prankster, joker and raconteur. All of these qualities are wonderfully shown in his autobiography Last Man Standing in which he lifts the lid on the movie business, retelling outrageous tales from his own life and career. There’s a glittering cast of great celebrities including Tony Curtis, Sean Connery, Michael Caine, David Niven, Frank Sinatra, Gregory Peck, John Mills, Peter Sellers, Michael Winner, Cubby Broccoli and many more. Wonderfully entertaining and laugh-out-loud funny, this selection of tales from the world of the movies is vintage Moore at his very best. A piece of movie magic signed by a true legend.